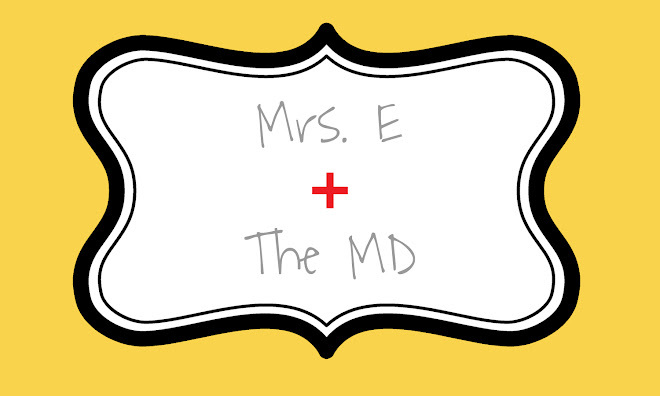 Mrs. E and the MD: Our girl! Noelle has been a non-stop, busy little girl as of late. She is on the go, into everything, and loving every minute. Her favorite things to do are to get in the cabinet under our bathroom sink and get into a mug of makeup brushes that I don't use. She loves to put them on her face and pretend like she is putting on makeup. I also find these not-so-cheap Bare Escentuals makeup brushes all over the house. I need to just get her a set of her own, but something tells me she will always like mama's better! She LOVES books! LOVES them! She is almost always holding a book. One of her favorites to pick up and carry around is the Merck Manual, which is about a 5 inch think medical reference guide. She can barely hold it, and she brings it to us saying "book," wanting us to read it. Yeah, right honey! She loves everything about reading and being read to. If we sit Indian style (not politically correct, I know), she will start about 3 feet away from us, turn around so her back is to us, and "back it up," by walking backwards until she reaches our legs. She will then sit and listen as we read her a book. We usually don't get past the first few pages before she is up and wanting another book. In fact, a few nights ago, I read her about 10 different books before bedtime. Noelle also loves to sit in her cute little rocking chair in her room. 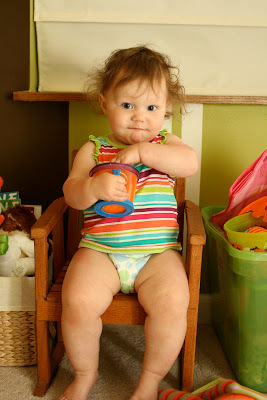 She will just go in there by herself and sit with her snacks or grab a book to read. It is so cute. She also loves to play with the doctor kit I got her in celebration of Luke's graduation from med school. She always brings the big box to us and says, "out!" Her favorite instrument is the syringe. She likes to take out the plunger part and blow into the tube. We are not sure how she got that idea, but it sure is one of her favorite things! We have started brushing her teeth every night now. We used to just do it when we gave her a bath (or when we remembered, which was seldom), but now we try to do it each night. She loves brushing her teeth! I think she just likes the fruity toothpaste, but it is fun watching her try! She is just talking up a storm. We think she has about 15 words that we can plainly hear and understand. It's amazing how quickly she is picking things up. Her new thing is when we carry her into a store, she will say "walk." She wants to walk in the stores, not ride in the cart, which can be a problem when she wants to grab everything off the shelves. In Kiawah, she grabbed a jar of salsa and dropped it on the floor of a grocery store. It shattered and made a big mess. Thankfully she wasn't hurt, but I was embarrassed as I found the manager and told her. Oops! Noelle is just the joy of our lives. Her laugh is infectious. Her smile is adorable. Her personality is sweet and a little sassy. I love her so much. She truly is our little "nugget"!